For the past few weeks, the stream team has been busy taking last minute water samples, making final gauge visits, and collecting algae. Several streams will continue to flow after we leave, so we have left the instrumentation running in the boxes to keep measuring flow just in case. The end of the season is also good for a lot of last minute construction since the ground is still not completely frozen, yet streamflow has slowed if there is still flow at all. Gauges that have been damaged during the flow season are repaired at this time, and new gauges are built either at new sites or to replace those that will be retired. 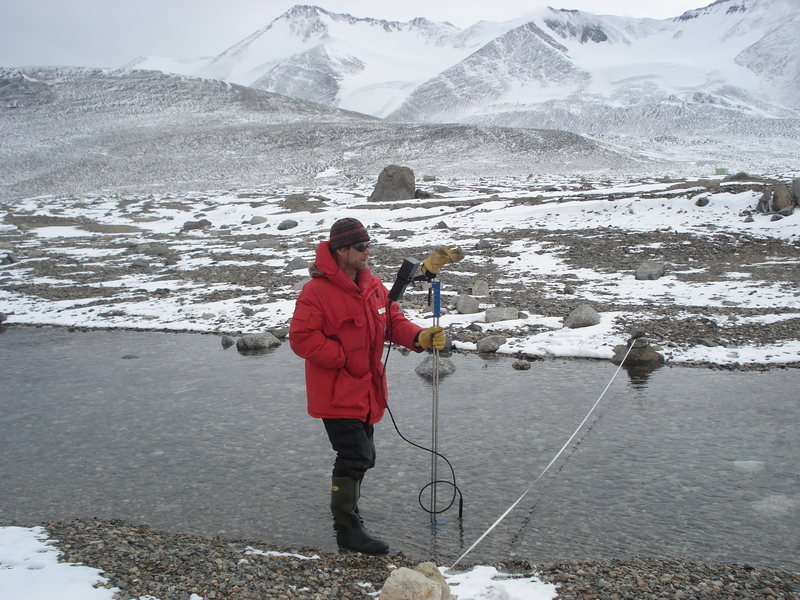 The last thing we do before we leave the Dry Valleys for the season is re-survey the streams just like we did at the beginning of the year. 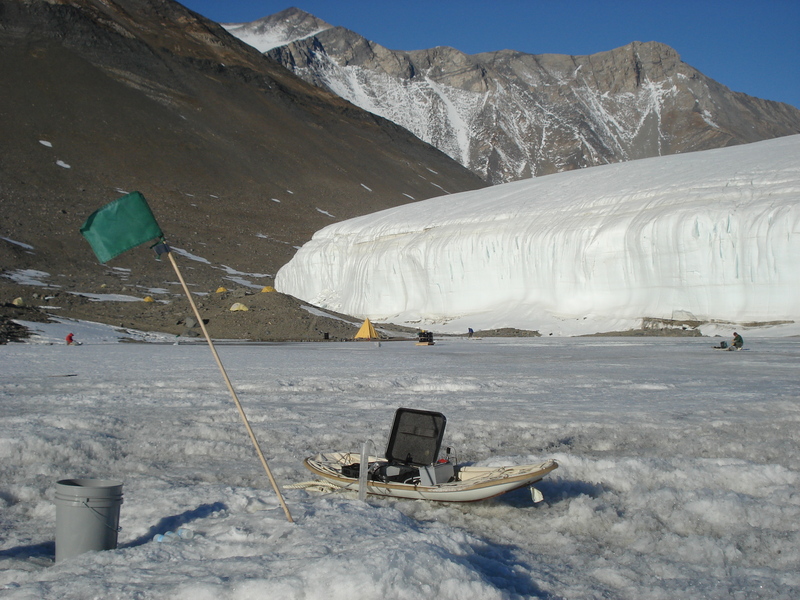 We also measure any changes in the levels of the lakes scattered all over the Dry Valleys to see if they are increasing, decreasing, or staying the same. Recently, Dry Valley lake levels have raised enough to require the 20-year old stream gauges to be migrated further upstream or abandoned completely. Additionally, some camp structures, sites, and transects have been claimed by the lakes, and will be an obstacle for planners for the next few years. For example, at Lake Hoare and Lake Bonney, numerous camp structures were moved to higher ground after the lake encroached upon their foundations last year. 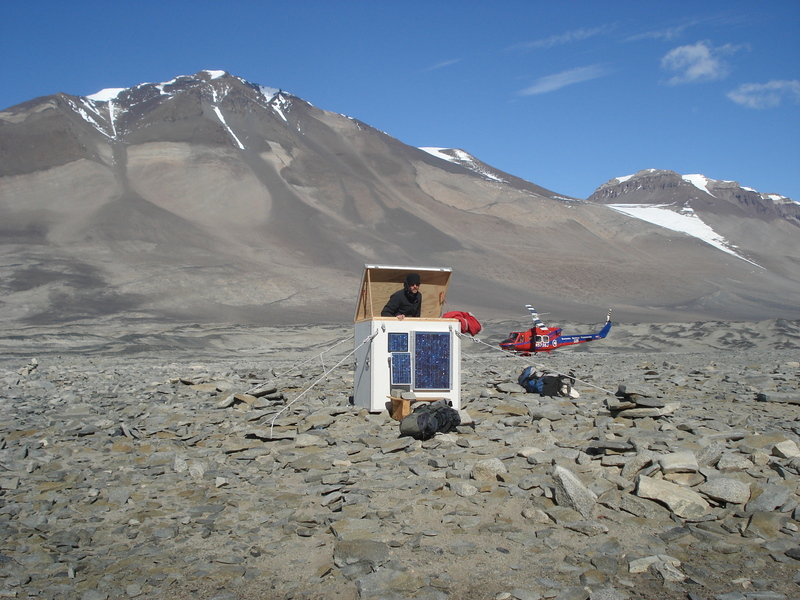 Most everything we have at our camps goes back to McMurdo by helicopter, including our tents, equipment, and our many samples. Some samples are taken to the Crary Laboratory and analyzed right away on station, while others are shipped back to the United States where we can do the analyses at our respective institutions. 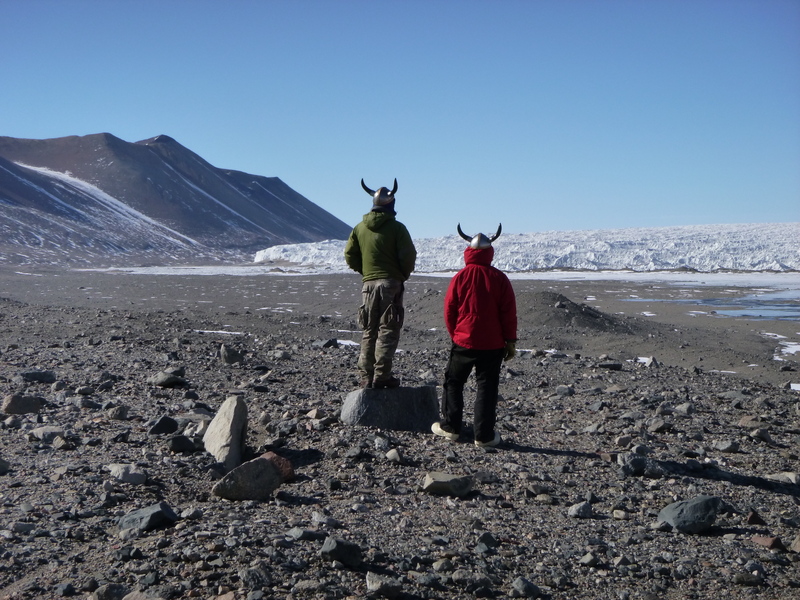 When all the work in McMurdo is done, we pack up our stuff, and step back onto the sea ice where there is an enormous C-17 waiting to take us back to New Zealand, where we will smell grass, experience darkness, and see dogs for the first time in almost 4 months. Another season may have come and gone, but in more ways than one, the sun never sets on Antarctica’s Asgard Rangers. 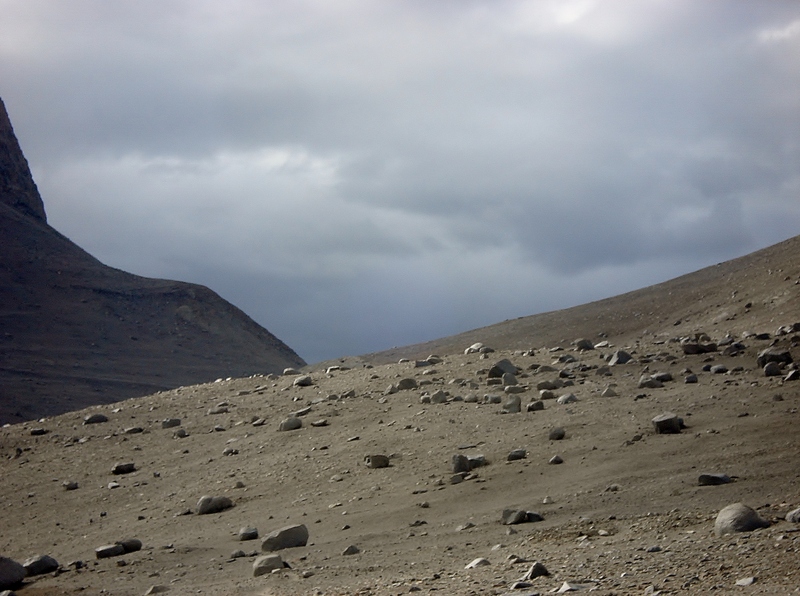 It may be surprising that a continent so famous for its seals and penguins would not have any living in the dry valleys. While they don’t live here, seals and penguins do get lost and wonder into the valleys occasionally. 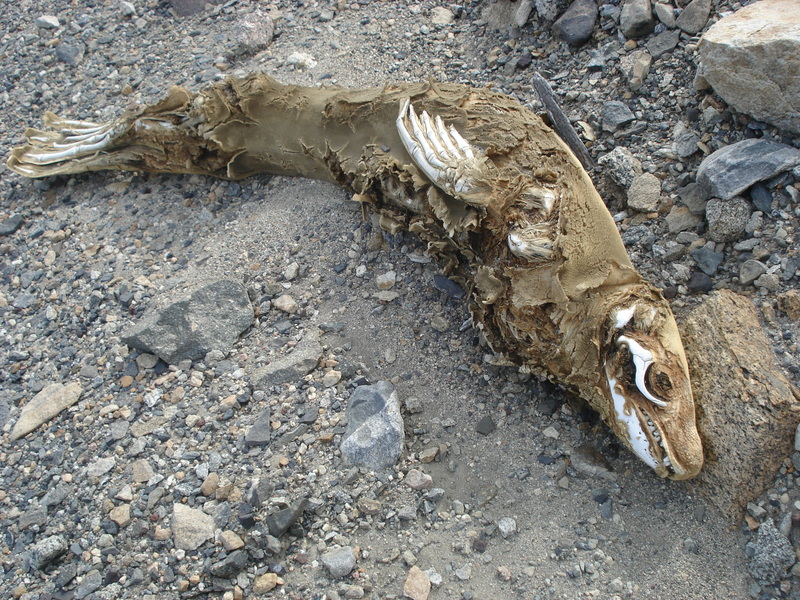 This generally doesn’t end well for the critter, and penguin and seal mummies are found all over the valleys, sometimes in quite surprising places. These can be very old, and some of them have signs of being picked apart by the Skua, which is a sea bird that occasionally flies through the valleys and is known for, among other things, its ability to steal a sandwich out of your hand. 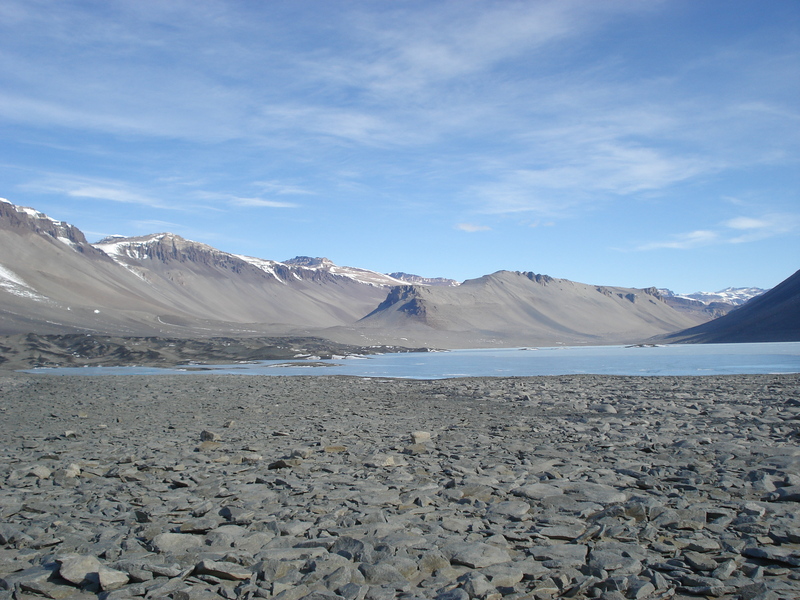 While there are no animals or plants living in the dry valleys (and the biggest creature you are likely to come across is a nematode), microbial life is abundant in the soils, lakes, and ponds. The Stream Team is particularly interested in the microbial mat communities that grow on the bottom of the streams. These mats are mostly made up of cyanobacteria, which hold the communities together. On the top of these mats is a protective layer of orange or black pigment that shades the mat from the harsh Antarctic radiation. Below this may be a whole host of creatures such as diatoms, tardigrades, and bacteria found in different layers of the mat. As part of the long-term ecological research (LTER) monitoring, these microbial mats are sampled from the streams in early to mid-January. This is done by taking a known area of the mat from the stream bottom with a brass cork borer for each type of mat present. This sampling has been done almost every year since the early 1990’s at transects across certain streams in order to look for changes occurring in a particular stream over time. What we now know is that some streams really don’t change all that much from year to year, while in other streams the algal mats have completely disappeared. Understanding the environmental conditions that control the abundance and distribution of these mats is important for making sense of observations such as these, but also for similar mat communities in other parts of the world. Perhaps more interestingly, these mats may tell us what primitive life on earth might have been like, as well as in other extreme habitats. 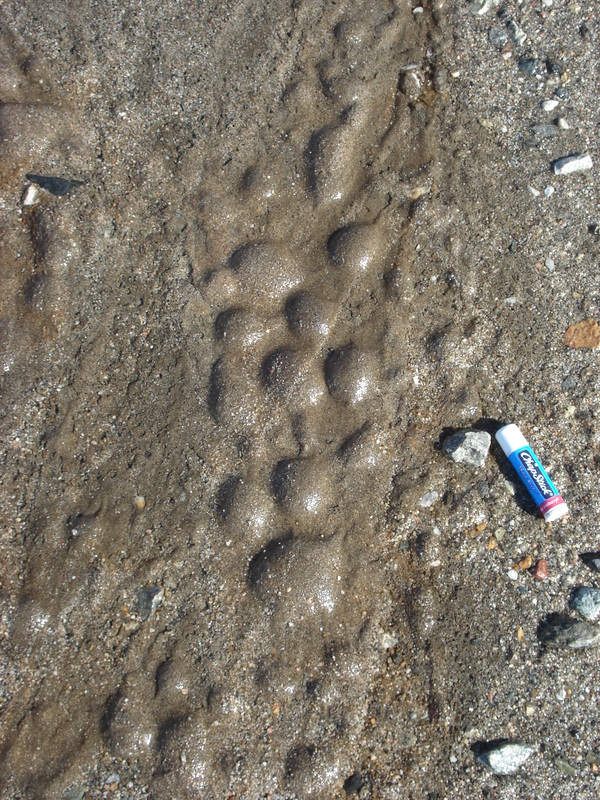 Additionally, since old streambeds have recently been found on Mars, it is interesting to think that if life has ever existed there, it may have been very similar to our Antarctic mats. Happy New Year from the Stream Team! 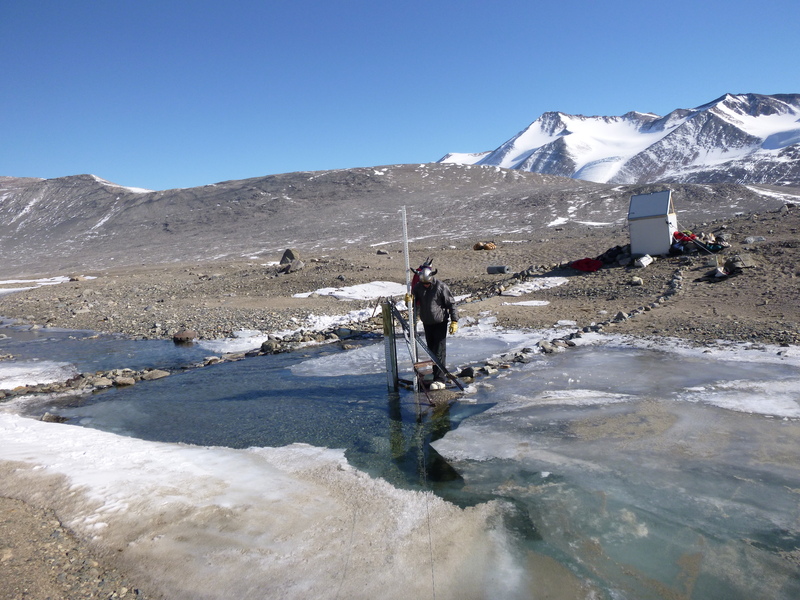 Stream visits are the reason we are in Antarctica. So now that the streams are flowing and the holidays are out of the way, stream visits will be keeping us busy for next month or so. 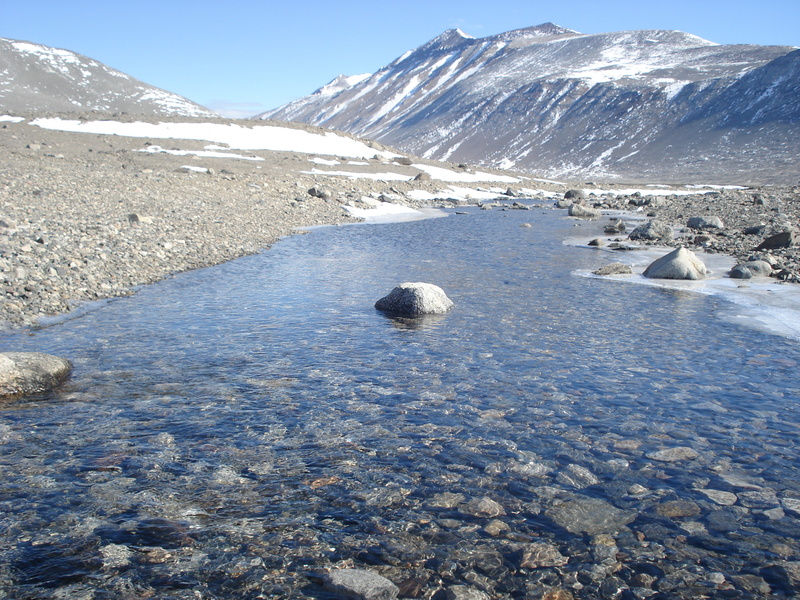 There are stream gauges at about 15 different sites in the dry valleys, and many more streams are not gauged but are monitored for water quality. 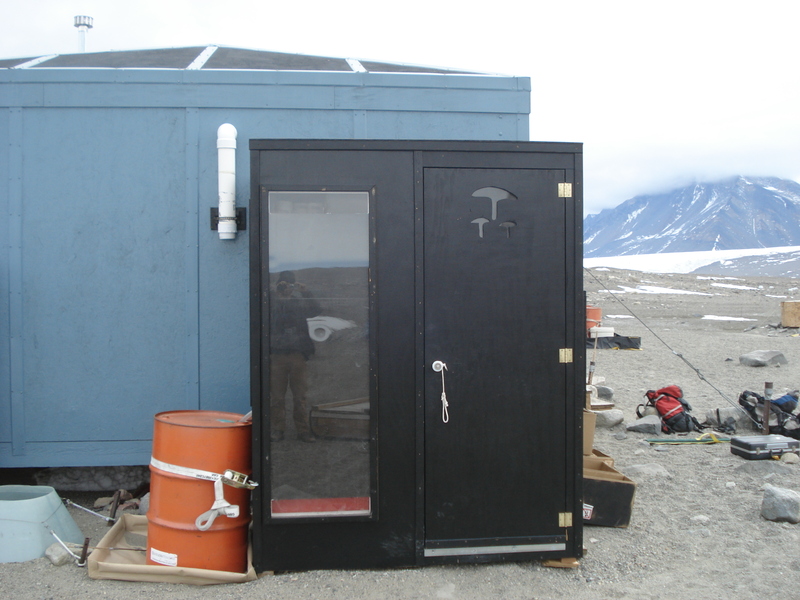 As we have mentioned before, these gauges consist of a big wooden box full of gadgets that essentially record the resistance it takes to pump a bubble of nitrogen out, which is proportional to the height of the water column above. However, the trick is to know the relationship between this value and the amount of water that is actually flowing in the stream at a given moment. To do this, we make manual discharge measurements. 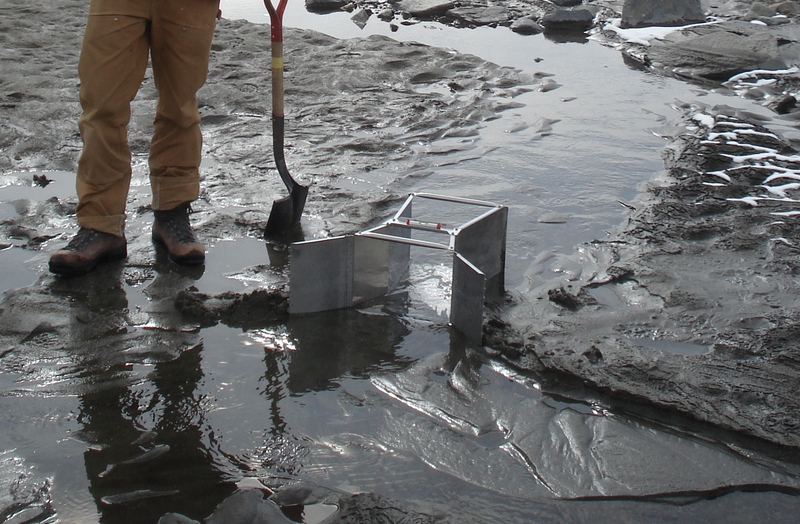 Manual measurements are done either with a pygmy meter (an updated version above) or a portable flume (below). The pygmy meter is an elegant tool that requires you measure the depth and the speed of the water by counting the rotations of a wheel at the bottom of a staff along different parts of a transect. By knowing the amount of water passing through the resulting “little rectangles”, one can calculate the discharge for the entire stream. The flume on the other hand uses marks on the sides to measure how much water is passing through at a given moment. The portable flume can therefore be a much quicker method, but can only be used at low stream flows. Another important aspect of a stream visit includes taking water samples. 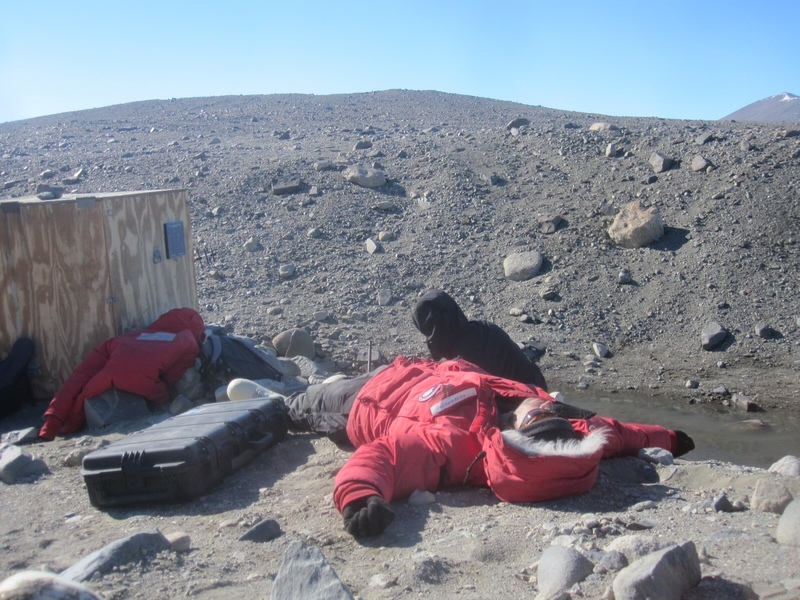 We collect small amounts of water in bottles, then take these samples back to camp where they are filtered and preserved until they can be sent back to McMurdo for analysis. 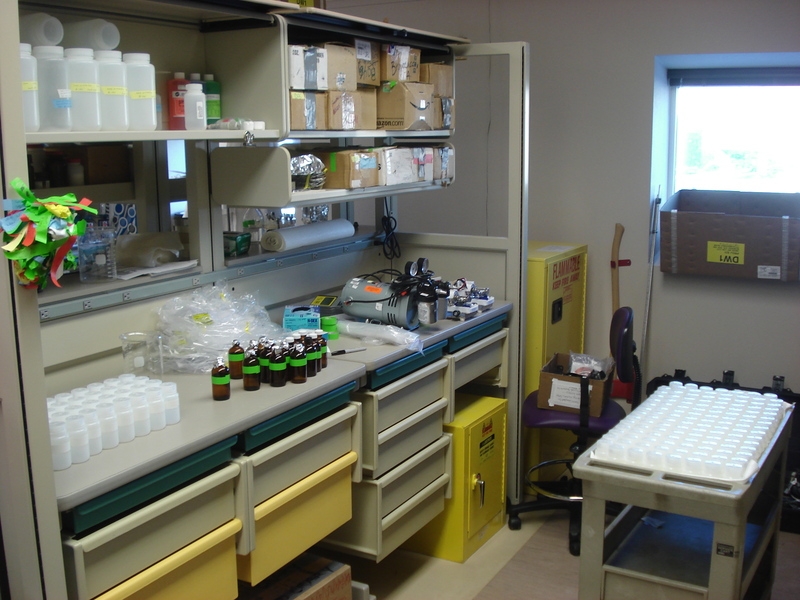 Many different tests are done, such as measuring the amount of dissolved organic carbon, nitrogen, and phosphorus. Filtering the particulates out of water samples generally takes a fair amount of time once back at camp. Good thing we washed all those bottles at the beginning of the season! We also collect “other kinds of water” while in the field. Since the Antarctic policy is to leave no trace, all waste is collected and shipped off continent. This applies to waste generated while sampling streams, and when natures calls, you better have a Nalgene bottle ready, because the nearest outhouse may be a helicopter ride over pristine glaciers and rocky peaks away! Happy holidays from the Stream Team! 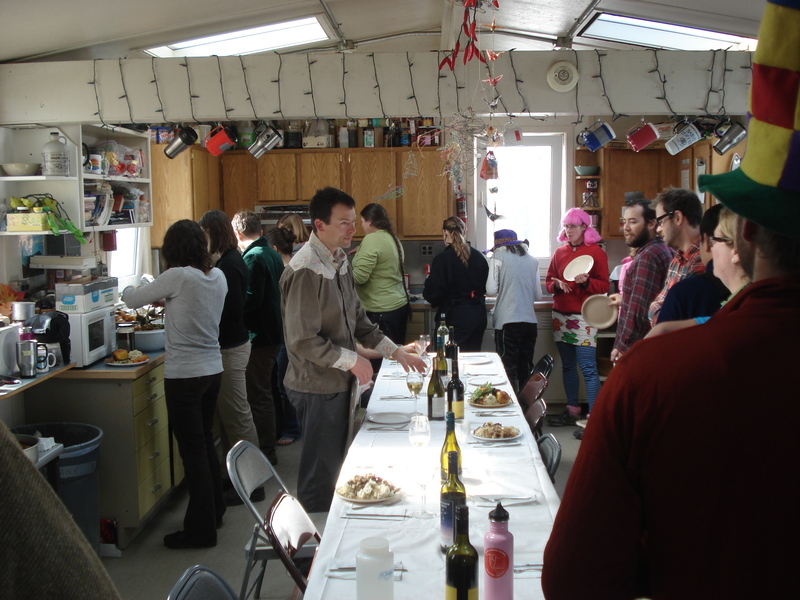 In Antarctica, the holidays are celebrated very differently depending on where you are, but they are always celebrated with enthusiasm. It is a Dry Valley tradition to spend Thanksgiving and Christmas at Lake Hoare. For Thanksgiving, everyone in the valley gathers at the Hoare camp and eats all the holiday favorites including turkey, stuffing, sweet potatoes, and pies. People even dress up for the occasion! This year, the Stream Team made the traditional walk from F6 around the Canada glacier to Lake Hoare for Christmas. 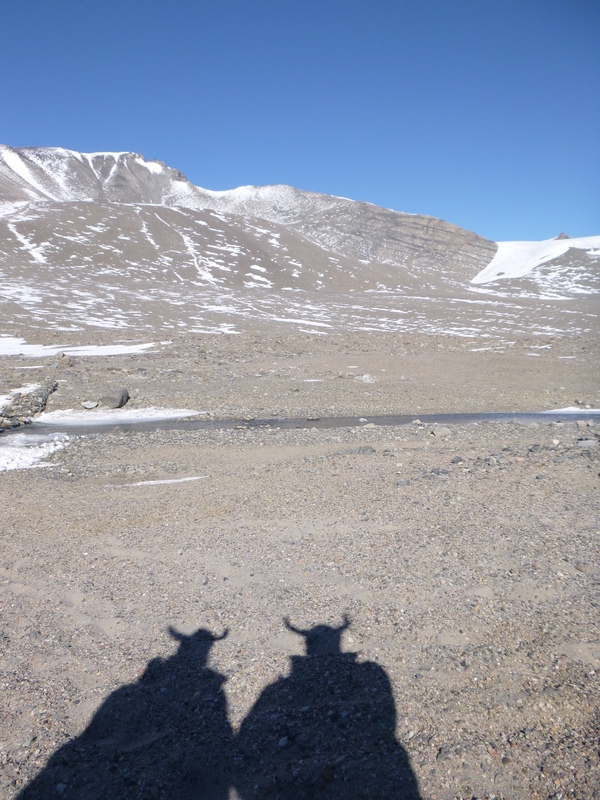 It even snowed at the time, which is a bit unusual for the Dry Valleys, but good for Christmas spirit! 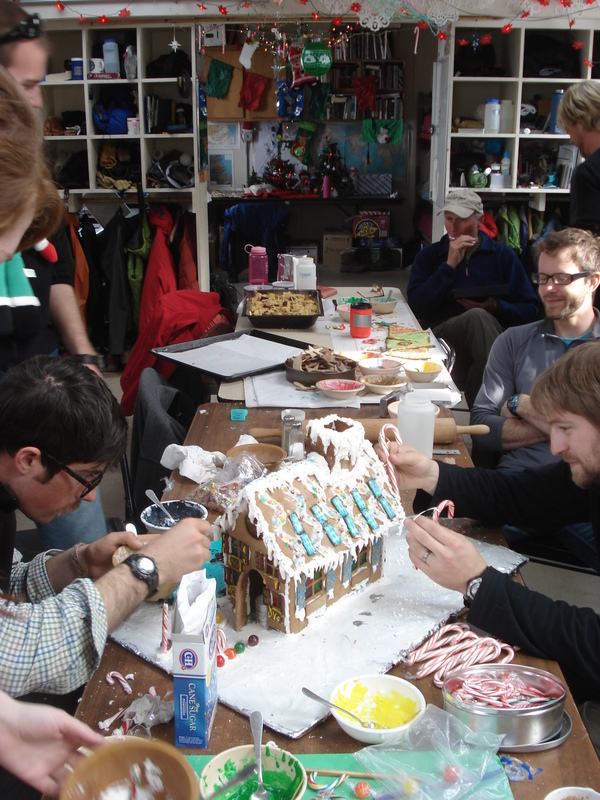 Once at the Hoare camp, we decorated sugar cookies, built a gingerbread house, and had a gift exchange. McMurdo usually has a nice celebration for New Years called “Icestock” which is complete with live music. 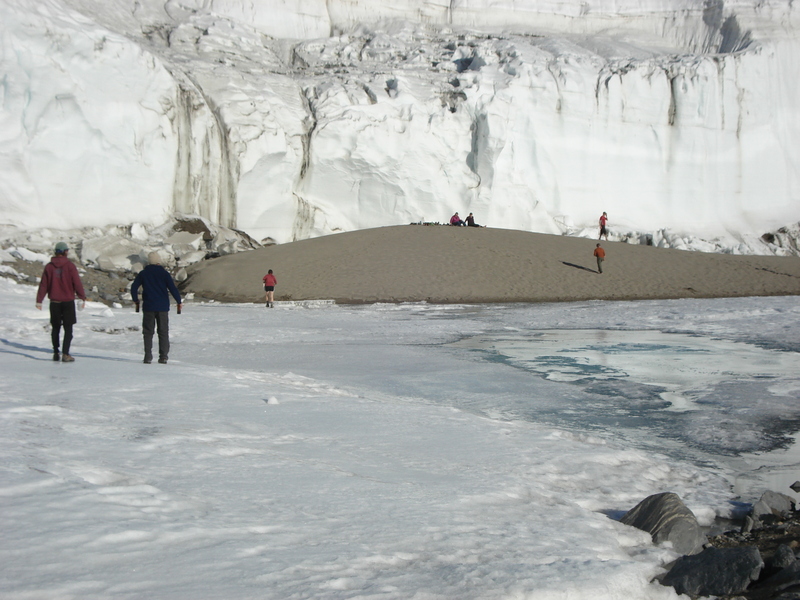 At Lake Hoare, New Years is a bit more low key and is likely spent at “the beach”, which is a warm sandy spot under the glacier that is perfect for counting down the seconds to a new year. It is also not uncommon to get into the costume box to help celebrate, which is full of wigs, dresses, and of course…leather pants. A couple days ago we helped with an experiment looking to see where water from Anderson Stream goes after it empties into Lake Hoare. This is an important question to answer because knowing where the water goes will help us understand the lake biology and hydrology, as well as the relationship between the dry valley streams and lakes. Ultimately, this may provide insight into how these relationships may change in the future if stream discharges continue to increase over time. The Stream Team helped with this experiment by injecting a known concentration of a naturally occurring element into the stream water so that its elevated presence can be used as a sort of tracer. After this was added to the stream water, we looked for it again by sampling water at different places in the lake over time, and by this method we can see where the water in the stream went. However, this was easier said than done. 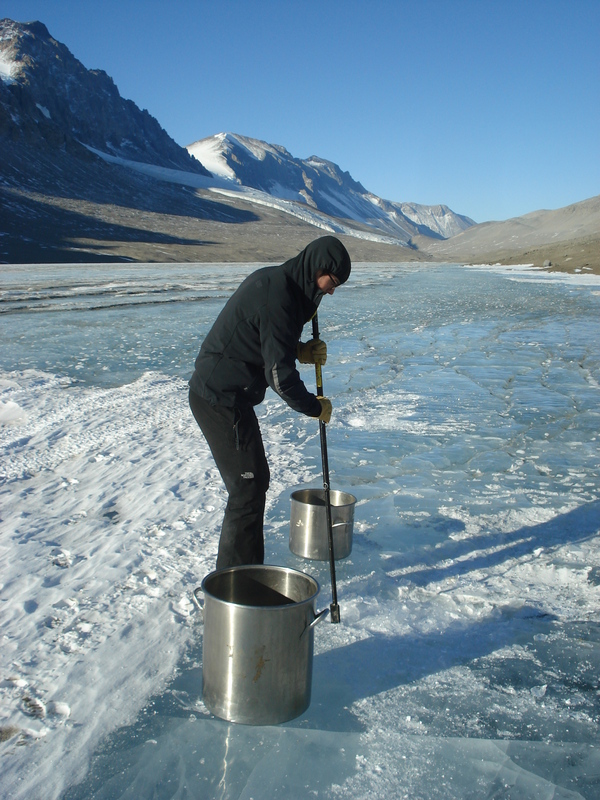 First of all, Lake Hoare is covered year-round with ice, making it difficult to sample the water underneath. 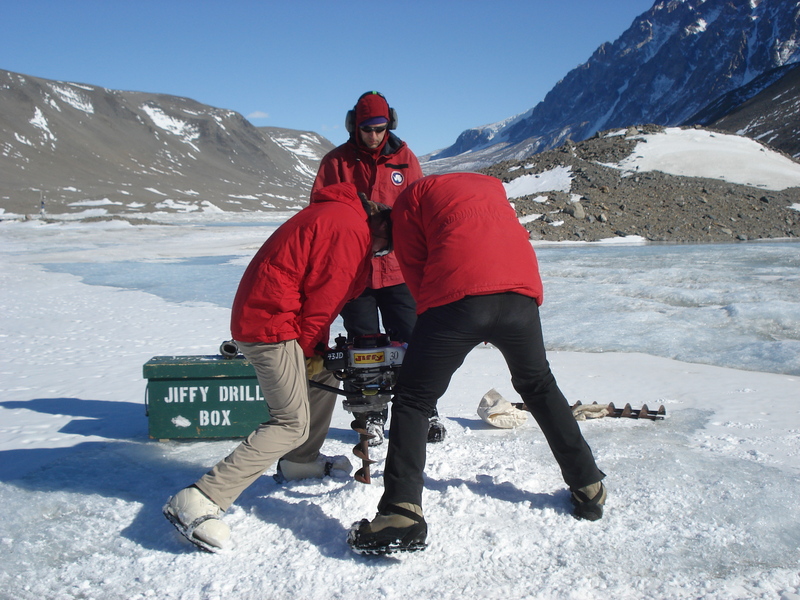 In fact, the only way this can be done is the hard way…by drilling holes into the ice and pumping the water out. The timing of this experiment was additionally critical, as a sufficiently high discharge is needed to detect the stream water in the lake. 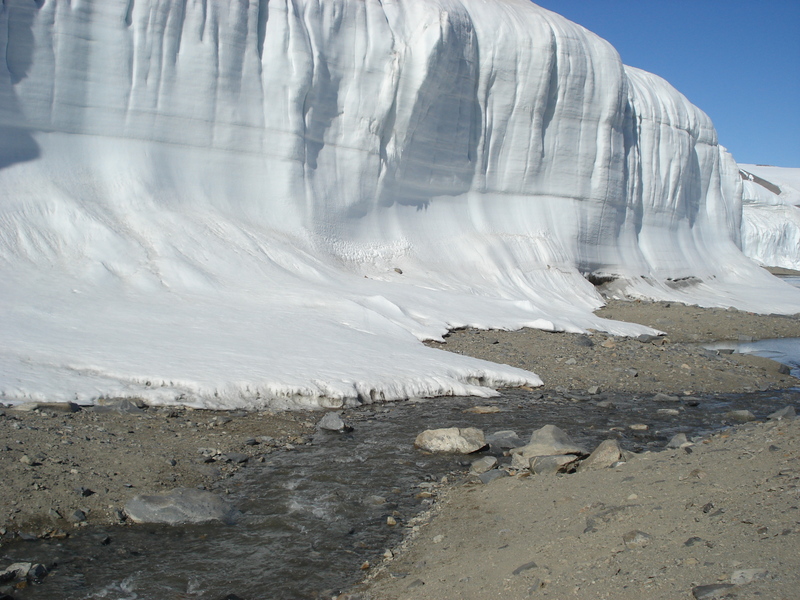 Stream flow in Antarctica is highly dependent on the weather, and just a few clouds lingering over the sun may turn off the stream like a faucet. Also, the stream has different peaks of flow throughout the day, depending on where the sun is in the sky. 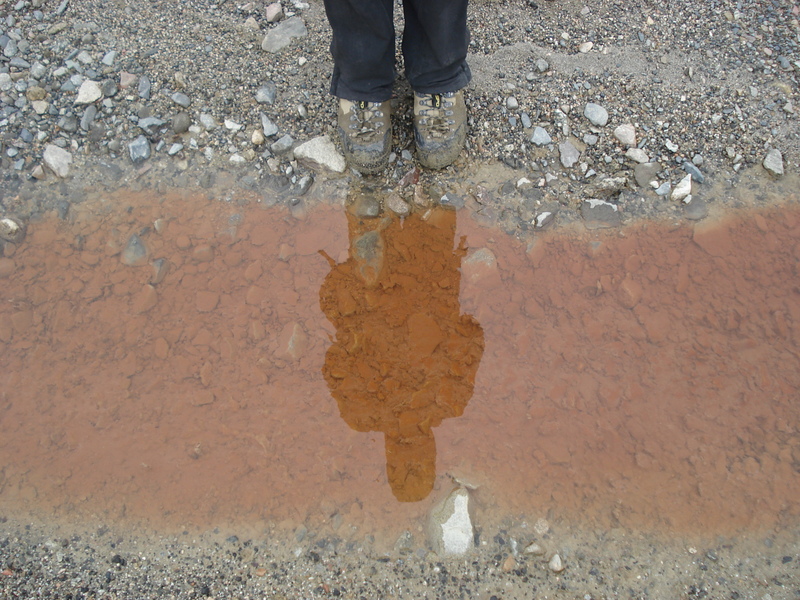 Since the right amount of water was important for the experiment, the weather and time of day had to both be perfect. As a result, there was some inevitable waiting and patience required. In the end, we got perfect weather, and the experiment went off without a hitch. Now we just have to wait to see what the data say! So what does an Asgard Ranger do all day? A typical day goes something like this: We wake up to find the sun in a relatively similar place as when we went to bed…something that seems less and less strange as time goes by. Before we do anything, our first order of business in the morning is checking in with “Mac-Ops”, which is the communications headquarters of Antarctica. If we do not check in by a certain time every morning, a search party will be sent for us. If it is a false alarm, there will be some folks unhappy with the Stream Team. After we check in, the next order of business is coffee. Lots and lots of coffee. And then perhaps breakfast while we check our email. 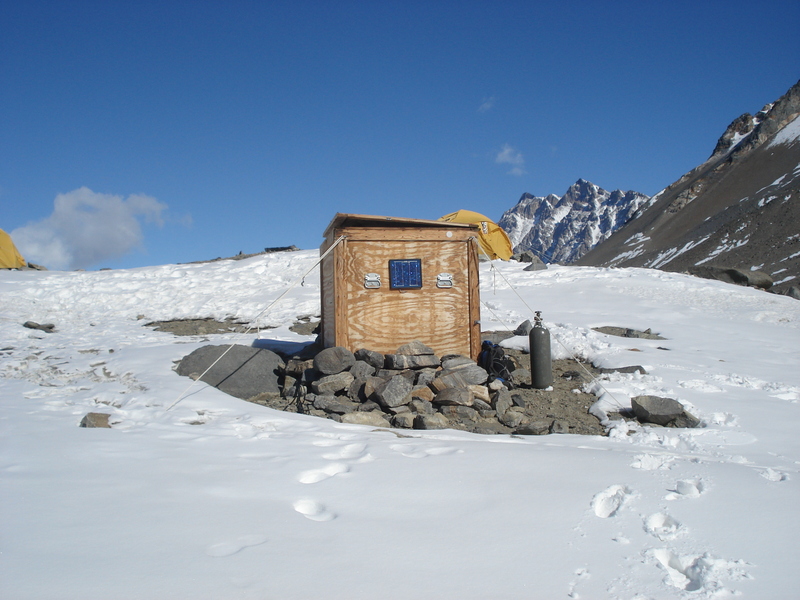 We have a small hut at each camp that is constantly heated with propane so that we always have liquid water available to us, as well as a place to put things that cannot freeze. In this hut we also have an oven, where breakfast goes from being a dream to reality. 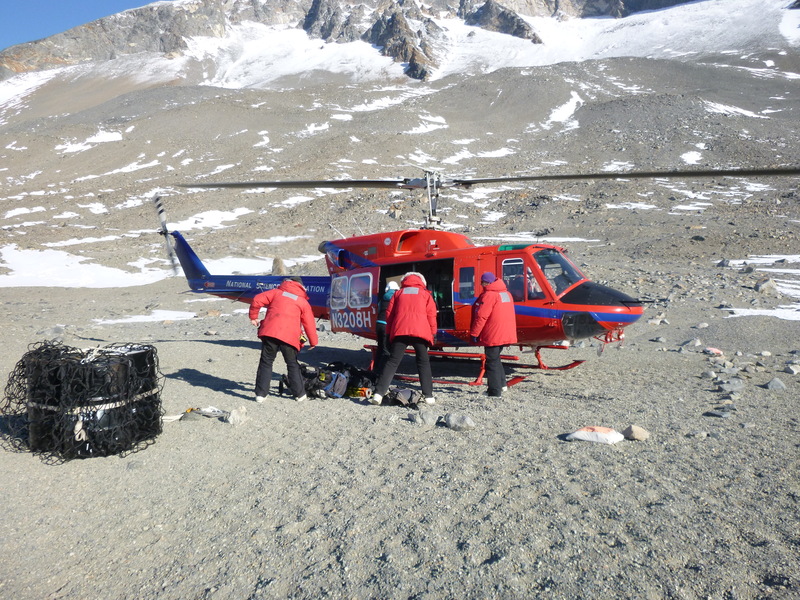 Depending on where we are and what needs to get done dictates what happens next, but generally it involves getting picked up by a helicopter and delivered to a stream, where we take samples, make measurements, and check equipment. If the stream sites are relatively close, we may take the ATV over the lake ice, or simply walk. When we are done, the helicopter comes back and returns us to camp, where we make dinner, process samples, and if there is time, play a round of cards or a quick game of Settlers of Catan. But, usually it is just processing samples. There are also a number of chores that have to be done around camp to keep things in good order. Since all waste must be collected and sent off the continent to process, including human waste, a fair amount of time is spent keeping things from piling up. For example, the “poo bucket” (which is really just a 5-gallon bucket) needs to be changed, along with the “pee barrel” which is a 55-gallon drum fitted with a funnel. At Lake Hoare, there is a rocket toilet that burns the poo, which is way cooler than putting it in a bucket. Water collection is a near daily task, and is done differently at different parts of the summer and at different camps. When the lake is still frozen, we may take an ATV over the ice to the nearest glacier. 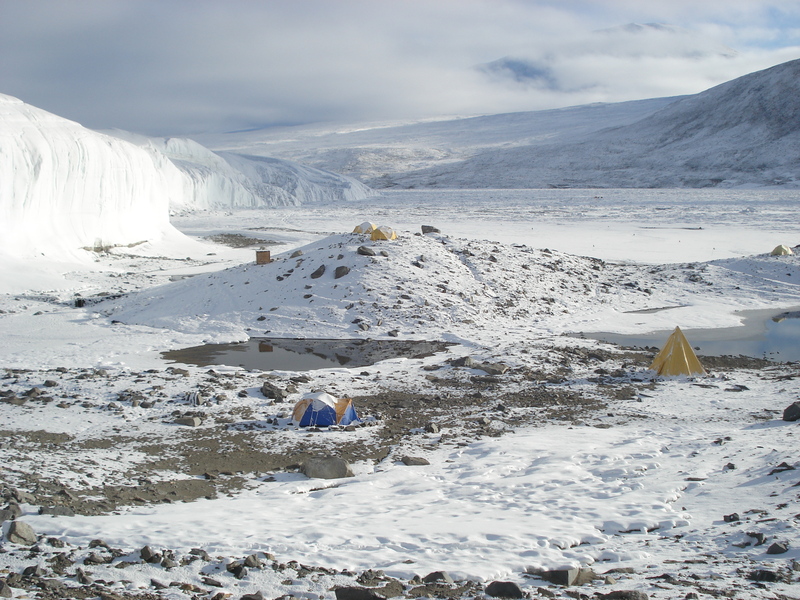 Over the winter the glaciers calve onto the ice, making for nice big blocks of ice that we can then load into a sled take back to camp. We call these “glacier berries,” and drop them off at the “berry patch” at the end of the lake. At F6 and Lake Bonney, the glacier is too far away for this to be a fruitful endeavor, so we generally chip at the lake ice with a chipper and melt the resulting flakes. Once the lake has melted around the edges and the streams begin to flow, making water is as easy as…well…filling a bucket with water. 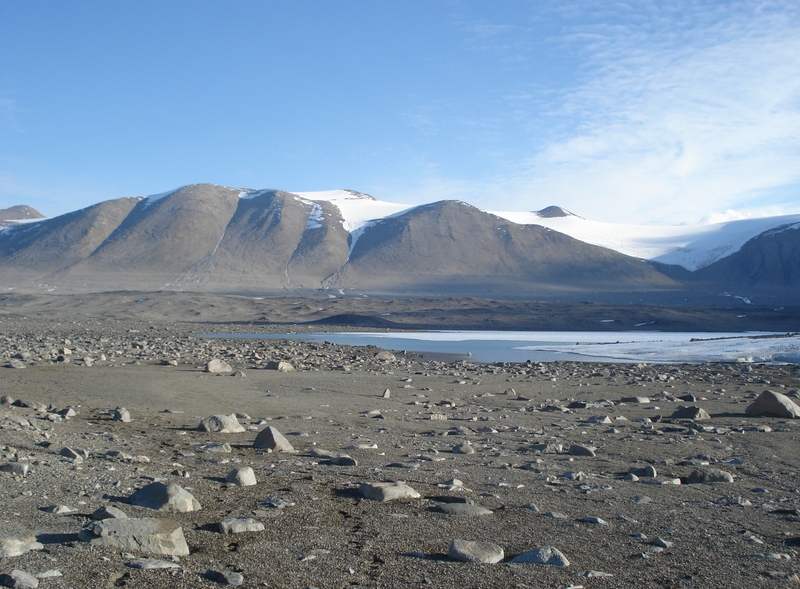 This week we went to Wright Valley, which is north of Taylor Valley and home of the longest river in Antarctica, the Onyx. For the first time this season, we saw streamflow! Flowing about 40 kilometers from beginning to end, the Onyx has the longest streamflow record of any stream on the continent, and begins in the late 1960’s. The Onyx is also unique in that there are two gauges; one at the headwaters and one at the Lake Vanda outlet. This is useful because we know how much water is lost due to evaporation as well as the chemical changes that take place along the distance of the stream. 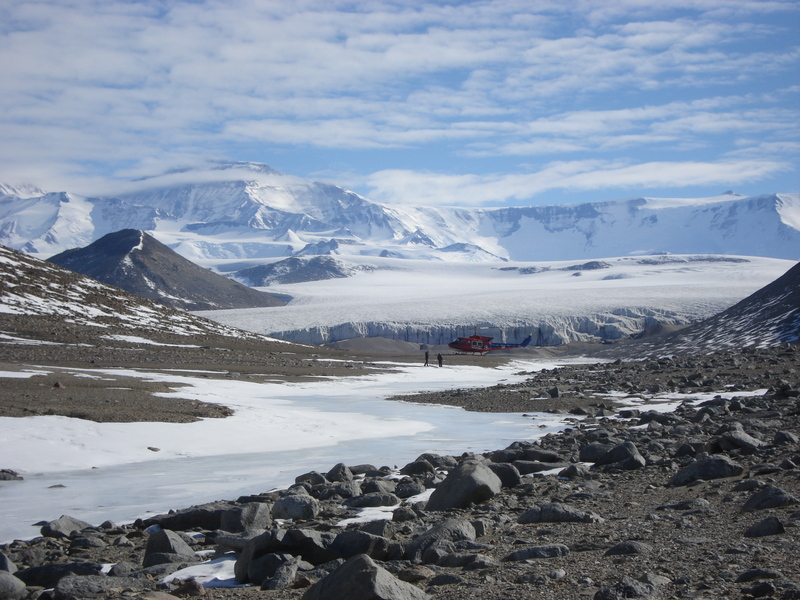 Interestingly, the journey from the Lower Wright Glacier at the headwaters to Lake Vanda is moving away from the ocean, or up the valley. Since this stream record is so long, it is often used as a reference for other Dry Valley streams and is handy for making comparisons among flow seasons. However, in order to keep this record the best it can be, it requires upkeep once in a while just like all the other streams. On this particular trip, we not only prepared the gauge for flow, but also gave parts of the gauge itself some much needed maintenance. 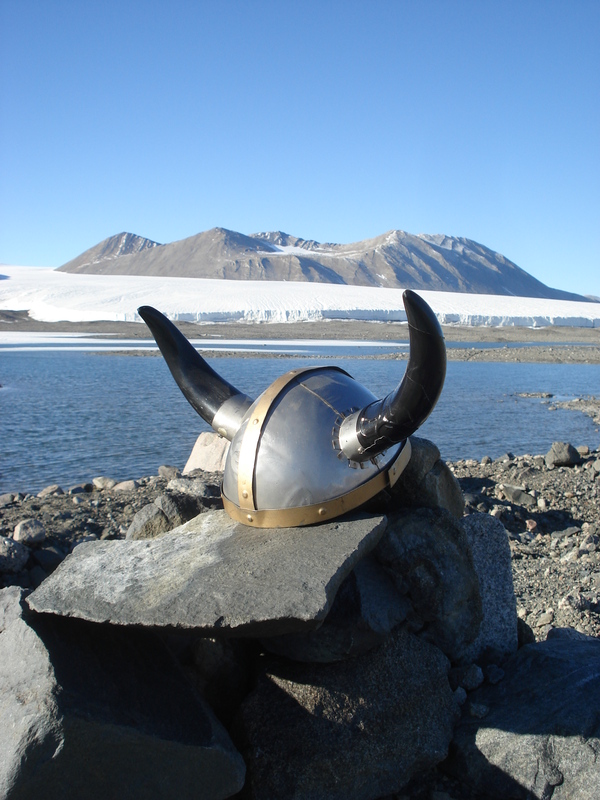 The New Zealand Antarctic Program initiated monitoring of Onyx steamflow, and their “stream team” called themselves the “Asgard Rangers”, adopting the symbol of the Viking helmet and a reputation for fierce science. So why the Asgard Rangers? Well, the mountain range that separates the Taylor Valley and the Wright Valley is called the Asgard Range, and was named after the mythical home of the Norse gods. Similarly, the mountain range to the north of Wright Valley is the Olympus Range, which was named after the home of the Greek gods. Along with the original Asgard Rangers were also the “Vanda Vandals” which were a limnology group that studied Lake Vanda, and an enigmatic group called the Mammoth Hunters (we dare not speculate what they studied). Relics from these proud groups can still be seen in the Lower Wright hut near our upper stream gauge on the Onyx, as the original Asgard Ranger hut was taken out because of the rising waters of Lake Vanda.